Welcome to The Abso!ute Sound online! We explore music and the reproduction of music in the home. We believe that the sound of music, unamplified, occurring in a real space is a philosophic absolute against which we may judge the performance of devices designed to reproduce music. Our goal is to provide the resources consumers need to judge how a component's sound either honors or departs from the music's truth, and to make sound purchasing decisions that maximize their experience of reproduced sound. Below is our Issue 222, April 2012 table of contents and link to the editorial. The price of this tubed integrated amp and DAC might say entry-level, but the sound is anything but. Garrett Hongo reports. This mid-priced all-tubed phonostage transcends mere hi-fi in its ability to bring music to life, says Paul Seydor. 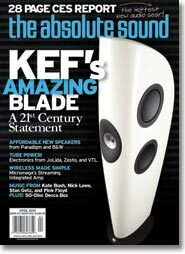 Allan Taffel on a statement speaker that sets new aesthetic, technological, and musical standards. Plus a tour of KEF’s technology centre. Wayne Garcia on an affordable stand-mount that improves upon its classic predecessor. Bowers & Wilkins once again proves its mastery of the small-speaker art. Kirk Midtskog reports. Thanks to Micromega's new integrated amplifier/wireless DAC, anyone can now step fearlessly into a future of wireless possibilities, says Neil Gader. Jacob Heilbrunn evaluates the latest version of VTL's superb two-box flagship linestage. Ted Libbey's omnibus review of the new (and bargain-priced) 50-disc anthology from one of the greatest classical record marques. New releases from Kate Bush, Nick Lowe, Carolyn Wonderland, Ruthie Foster, and the Little Willies; the Beach Boys' Smile Sessions; and superb reissues of Pink Floyd and Marianne Faithfull. Pyrotechnics from violinist Joshua Bell, cellists Zuill Bailey and GavrielLipkind, duo-pianists Anderson and Roe, Trio Arbos, and composer Jenny McLeod. The latest from Jack DeJohnette, Charlie Haden and (the late) Hank Jones, Theo Bleckmann, and Macy Chen, along with a four-LP reissue of vintage Stan Getz. 141 Five Faves: Stephen Estep's favorite-ever steel guitar solos. 144 Back Pages: We interview Paul Stookey of Peter, Paul & Mary.